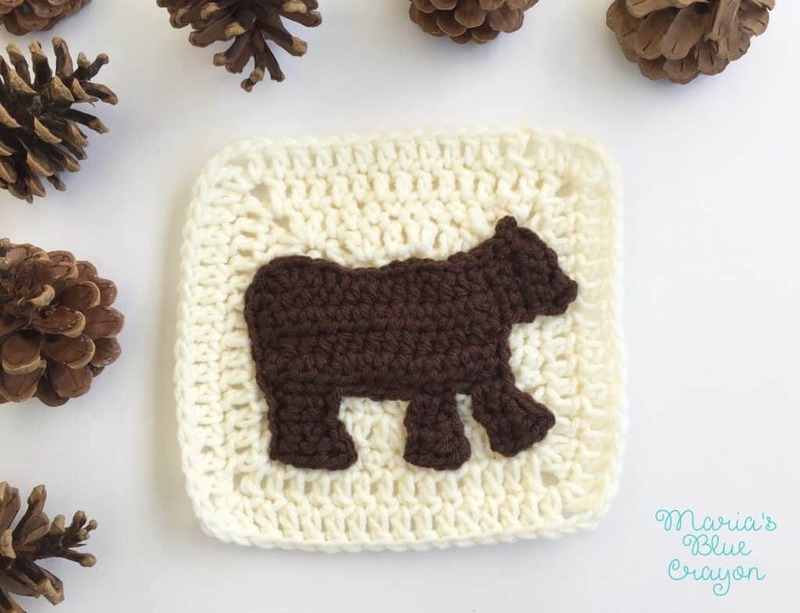 GET THE BEAR APPLIQUE ALONG WITH THE GRANNY SQUARE CROCHET PATTERN IN AN AD-FREE PDF DOWNLOAD HERE. We just had our first snow fall here in Central Pennsylvania this past week! That means we had a snow day and I had lots of time to hunker down and get crackin’ on this afghan! I have two new squares to share with you – this woodland bear and a little hedgehog you can check out here. This applique will be worked in rows and around. There will be no breaking of yarn although I do try to break up/explain each part that is being made along the way. That completes the body of the bear and we will start to work on the legs. Do not break yarn. Keep working around to form the top of the head and the top of the body. 2 sl st ( you should now be back onto the main body) 2 sl st, 3 SC, 5 sl st, SC, HDC, 3 DC in same stitch (last stitch on top of the body – keep working around) DC, HDC, 3 SC, slip stitch until you reach the bottom of the back feet. Unfortunately, I do not. I have never made a video yet, although I am planning on having videos available in the near future! I love this so much, I am working on a piney woodland afghan and these animals are perfect! How did you do the actual granny square? I'd like to start off by saying thank you for sharing these adorable patterns. I'm having fun making these squares and looking forward to the finished afghan. I'm having trouble with the bear though. I'm not sure I'm reading the pattern correctly but try as I might, I can't get the same contours of the face and head. Mine looks nothing like yours. If you do decide to make a video, would you consider making the bear first. I really need help here. Thanks again for sharing. It's so kind of you to share your talent with others. I am having ths same issue's with the bear pattern and i am an expeiced crocheter and pattern reader a video would be greatley appreciated. Hi Jenna! Sorry you're having issues. I did have this bear tested and re-wrote directions but I understand it can be a bit confusing. I am working on creating video tutorials. If there is a certain section I can explain in the mean time, please let me know! I am looking forward to the video… my bear looks more like a cow. The contours are not right and it looks too skinny in the middle. Thank you for sharing your patterns. I'm having problems with the bear. Do you have a video? Would appreciate the help. Blessings!